Haplogroup I is a fairly rare matrilinear lineage, being found in average in 2% of Europeans and under 1% of Near Easterners. Slightly more elevated concentrations are found in Daghestan, notably among the Dargins (6.5%), Chechens (6%) and Kumyks (5.5%), as well as in isolated parts of Europe such as Mordovia (6%), Latvia (4.5%), Lithuania (3%), Finland (4%), Brittany (3%), Great Britain (4%), Ireland (3%) and Iceland (4%), but also Serbia (3.5%), Croatia (3%), Bosnia-Herzegovina (3%) and parts of Italy. Haplogroup I is absent from Lapland, the Basque country and the Maghreb, three regions that share high levels of mt-haplogroups U5 and HV0/V. Haplogroup N1a, excluding the N1a1b2 subclade (i.e. 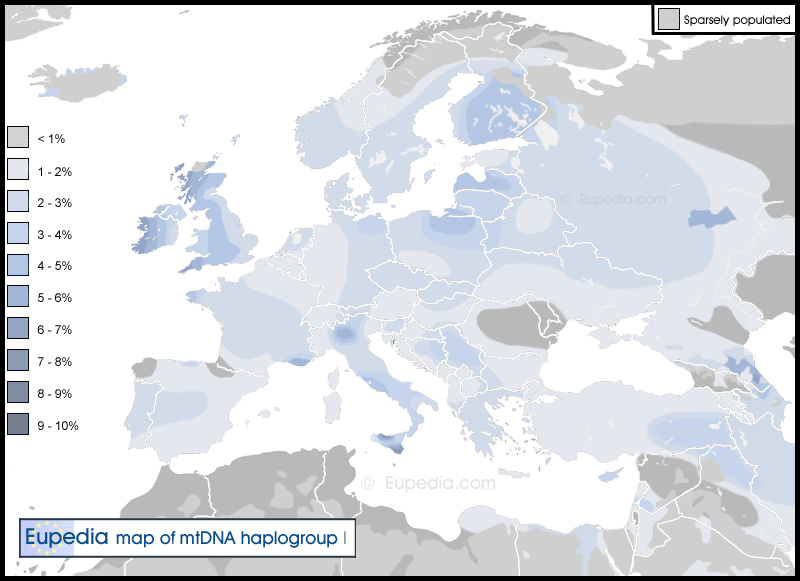 haplogroup I), is even rarer, being found is less than 0.5% of the European population. N1a(xI) is most common in Yemen (2.5%), Saudi Arabia (2.5%), Kazakhstan (1.5%), Egypt (1%), Armenia (1%), Bosnia-Herzegovina (1%), Lithuania (1%) and Estonia (1%). There seems to be an overlap in distribution between haplogroups N1a and I in the Dinaric Alps and Baltic countries. Haplogroups N1a and I have never been found in ancient samples from Paleolithic or Mesolithic Europe. The oldest known N1a samples were found in Pre-Pottery Neolithic cultures from central Anatolia. Kılınç et al. (2016) retrieved two N1a1a1 samples from the Boncuklu site (8300 BCE), as well as two N1a1a1 and two N1b1a from the Tepecik-Çiftlik site (± 6400 BCE). Mathieson et al. (2015) also found one N1a1a1 and three N1a1a1a from the Barcın and Menteşe sites (± 6350 BCE) in north-western Anatolia. The paternal lineages that accompanied them belonged to mostly Y-haplogroup G2a2, but also to C1a2, I2c, H2 and J2a. N1a lineages were also found in practically all Early Neolithic cultures in Europe. However, so far it has never been found in the Fertile Crescent itself, although N1b was identified by Lazaridis et al. (2016) in the Mesolithic Natufian culture in Israel. Based on current evidence, it would seem that the roots of haplogroup N1a are in Anatolia, whence it spread with Neolithic farmers to Europe, and perhaps also to the Caucasus region. The earliest evidence of N1a in Europe comes from the Early Neolithic, when it suddenly pops up in 16 of the 146 skeletons tested to date from various sites of the Starčevo culture (7% of all samples) in Croatia and Hungary, and especially the Linear Pottery culture (LBK) in Germany (see Adler 2012 and Brandt 2013), where it reaches the spectacularly high frequency of 12.75%. This may have been due to a founder effect among LBK farmers, but it is noteworthy that later Neolithic cultures in the region kept high levels of N1a compared to modern Germany. That included samples from the Rössen (9%) and Schöningen (3%) cultures, as well as the Baalberge (5%) and Salzmünde (7%) groups of the Funnelbeaker culture, spanning the whole Neolithic and early Chalcolithic periods. These German samples belonged to the N1a1a, N1a1a1 and N1a1a3 subclades. From the time of the Corded Ware culture, representing the advance of Proto-Indo-European speakers from the Pontic Steppe of Ukraine and southern Russia, haplogroup N1a suddenly disappears from the record in Central Europe, and would never come back. N1a was also found in the Alföld culture in Hungary, an eastern branch of the Linear Pottery culture, as well as in Megalithic France. Nowadays N1a is also found in modern Cushitic populations of East Africa. In fact, the same N1a1a3 that was found in Neolithic Germany is now found essentially in Somalia and Ethiopia, in the Horn of Africa. This region has the world's highest frequency of Y-haplogroup T, the greatest diversity of Y-haplogroup E1b1b, and also a substantial percentage of Y-haplogroup J1, three paternal lineages thought to have been found among early agriculturalists from the Fertile Crescent alongside Y-haplogroup G2 - four of the "Neolithic founder Y-DNA haplogroups". Therefore it is possible that N1a originated with Y-haplogroup G2, J1 and/or T during the Upper Paleolithic, then spread with all four haplogroups after G2a converged with E1b1b and T in the Fertile Crescent later during the Neolithic period. N1a1b might have expanded directly from Anatolia to the Caucasus and northern Iran, where it developed N1a1b1 (found in Iran today) and N1a1b2 (haplogroup I). In this scenario, R1b cattle herders from eastern Anatolia would have absorbed mtDNA I by intermarriages with Caucasian women on the way to the Pontic Steppe. This would have happened with other mtDNA lineages too (see maternal lineages corresponding to haplogroup R1b). Whatever the exact route and timing, haplogroup I was almost certainly found in the northwest Caucasus when the Maykop culture appeared around 3700 BCE, and would consequently have become part of the Proto-Indo-European tribes before the great migrations to Europe and Central Asia. Haplogroup N1 was found in the Maykop (or adjacent Novosvobodnaya) culture by Nedoluzhko et al. (2015), while remains of the Yamna culture in the Pontic-Caspian Steppe itself have so far yielded haplogroups N1a1a and I1a. Haplogroup I has not been found in Neolithic remains from Europe to date. It first shows up in Chalcolithic Catalonia (c. 3500-3000 BCE) as I1c1. Interestingly, it was accompanied by haplogroups U4 and W1, two typically East European lineages, which hint that the Catalan site may represent an early migration of Steppe people in western Europe. It is during the Late Copper Age and Early Bronze Age that haplogroup I start cropping up regularly in European remains, first in the Corded Ware culture (2.5% of all samples), associated with the expansion of Y-haplogroup R1a, but especially with the Unetice culture (13% of all samples), linked with the arrival of R1b people around modern Germany, Czechia and western Poland. Whereas N1a was found essentially among Near Eastern Neolithic farmers, haplogroup I displays a strong connection with the Indo-European migrations. The higher frequency of I in the North Caucasus today also alludes to a link with the Maykop culture, the world's first militaristic Bronze Age culture, which was intricately connected with the Yamna culture of the Pontic Steppe (see R1b history). Wilde et al. (2014) tested mtDNA samples from the Yamna culture, the presumed homeland of Proto-Indo-European speakers, and the subsequent Catacomb culture, and identified I1 samples in both cultures. Lineages found among the Unetice culture belonged to the I1, I1a1 and I3a subclades, I1a1 being the most prevalent among them. The oldest known R1b1b2 sample from the Unetice culture is an individual from the late Corded Ware or pre-Unetice culture (2600–2500 BCE) in eastern Germany who happened to belong to mt-haplogroup I1a1. Haplogroup I was also found in Scythian remains in Siberia (I4 subclade, Keyser et al. 2009) and in southern Russia (I3 subclade, Der Sarkissian et al. 2011). Another way to determine whether a particular lineage could have been spread by the Indo-European migration is to compare their modern distribution in regions historically settled by the Indo-Europeans, which besides Europe also comprises most of Central Asia, parts of Siberia (notably the Altai), as well as South Asia from Iran to western India. Haplogroup I is indeed present in all these regions. Unfortunately data about specific subclades is still sparse, but I1a appears to be the most common form of I in Uzbekistan and Turkmenistan, the two Central Asian countries with the highest percentages of R1b. I1a is also common in central and eastern Europe, in the Caucasus and in the British isles. Haplogroup I2 is found in most of northern Europe, but also in the Caucasus, in Siberia and among the Pasiegos of Cantabria in northern Spain, who has possess other typically Indo-European maternal lineages like H6, J1b1a, T1a1a, U2e, U4 and U5a1a and surprisingly high levels of Y-haplogroup R1a (see Maca-Meyer et al. 2003). I3 is found mostly in countries with high percentages of R1b in northwestern Europe, and its presence in the Unetice culture and among ancient Scythians confirm an Indo-European origin. I4a is scattered around all Europe, but is also found around the Black Sea, the North Caucasus, Iran and Siberia, all regions settled by the Indo-Europeans. Three I5 samples were identified in a site from the early Minoan civilization by Hughey et al. (2013). The fact that the Minoans were a pre-Indo-European Greek culture casts doubt on the Indo-European origin of I5. Nevertheless, its modern distribution ranges from the North Caucasus to central and western Europe, argues in favour of an Indo-European dispersal. The case of I5 cannot be settled in light of the present data. On the other hand, the modern distributions of I4b, so far found only in Iran, I6, found in northern Iran, Turkey and Sicily, and I7, found in Armenia and Mesopotamia, do not suggest a Steppe connection. The pre-Indo-European development of haplogroup I in the Caucasus can explain why subclades like I6 and I7 aren't associated with the Indo-Europeans, but instead with other populations from Anatolia and the Caucasus. These were probably lineages from the South Caucasus, which became part of the Kura-Araxes culture during the Early Bronze Age, and expanded to Anatolia and northern Mesopotamia. Kura-Araxes men are thought to have belonged essentially to Y-haplogroup G2a and J2, with a minority of J1 and T. After centuries of intermingling with other Anatolian people, they may have indirectly become the ancestors of the ancient Greek people. In the Classical Greek Antiquity, I5 and I6 would have been spread to Magna Graecia (southern Italy), especially southern Sicily and Apulia, which were Doric colonies with direct links to Crete. The A10398G mutation defining haplogroup N1a1 (and therefore also found in all members of haplogroup I) has been associated with increased longevity (Dato et al. (2005), Shlush et al. (2008) and Nijiati et al. (2013)) and protection against PD (Ghezzi et al. (2005) and Clark et al. (2011)). The common C150T mutation has been found at strikingly higher frequency among Chinese and Italian centenarians and may be advantageous for longevity and resistance to stress according to Chen et al. (2012). C150T defines haplogroups I5a3, but may also be found occasionally among other subclades. Hendrickson et al. (2008) studied the role played by mitochondrial function in AIDS progression in HIV-1 infected persons. They found that AIDS progression was slower for members of haplogroup I.
Haplogroup I is defined by T10034C, a rare mutation in tRNA encoding Glycine. This amino acid is a known an inhibitory neurotransmitter in the central nervous system, especially in the spinal cord, brainstem, and retina. Variations in the production of glycine in the mitochondria could affect the quality of sleep and the risk of schizophrenia (both positively if production is increased). Glycine also happens to be a biochemical precursor of porphyrins, organic compounds that strongly absorb light, which is then converted to energy and heat in the illuminated areas. Porphyrins have been used in the context of photodynamic therapy and macular degeneration. It is possible that carriers of the T10034C mutation (i.e. all members of haplogroup I) absorb light more efficiently due to an increased production of glycine and porphyrin. That would explain why haplogroup I, which apparently came to Europe in great part with the Indo-European migrations, seems to have undergone a positive selection in northern Europe, where light is more scarce, and especially around the Baltic, in northwest Russia and in the cloudy British Isles. A study conducted by Maruszak et al. (2014) analysed the mtDNA of 395 elite Polish athletes (213 endurance athletes and 182 power athletes) and 413 sedentary controls and found that haplogroup I is among the most underrepresented mtDNA types among endurance athletes at the Olympic/World Class level. Nevertheless, members of haplogroup I1c carry the 16362C mutation, which is one of the two polymorphisms associated in this study with achieving the elite performance level. Another study by Murakami et al. (2002) associated the 16223T (found in all members of haplogroup I) and 16362C polymorphisms with higher training responsiveness. Three other polymorphisms were associated with increased VO2max, including 199C, which defines haplogroup N1a1'2 and is consequently found in all members of haplogroup I. Queen Noor of Jordan (born 1951) was the fourth wife of King Hussein of Jordan, and queen consort between their marriage in 1978 and his death in 1999. She is the longest-standing member of the Board of Commissioners of the International Commission on Missing Persons. She has been president of the United World Colleges movement since 1995 and an advocate of the anti-nuclear weapons proliferation campaign Global Zero. The queen was a guest in the PBS television series Faces of America, for which she got her DNA tested. Her maternal lineage was revealed to belong to haplogroup I2.